Categories: Haiku, Micropoetry, Poetry, Three Line Poetry | Tags: CARPE DIEM HAIKU KAI, Poetry | Permalink. This is lovely!! It is a huge celebration here in Quebec. The scene moves around a lot through three lines from rituals to bonfire to the sun. 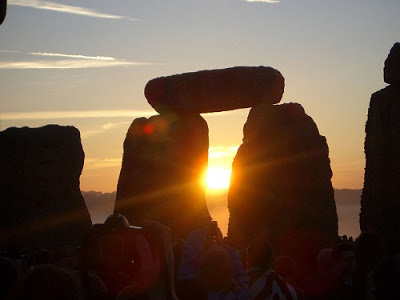 An ancient solstice ritual was to build bonfires that night that would flicker, much like the sun between the stones during the day. Thanks, that is the prompt picture though from CDHK, not one of my own. I would love to visit Stonehenge someday. Bonfires and sun.. sounds wonderful for the shortest night of the year. Great match to a breath-taking photo, DE. Could you imagine seeing that with our eyes? Wow. MDH went on a post graduation European vacation in the early 80’s and happened to go to Stonehenge on June 21st. Hawkwind was playing in concert there too. What a trip, both literally and figuratively.